The Children’s Rights Alliance today (29 May 2017) welcomed the publication by An Garda Siochana of an independent audit of section 12 of the Child Care Act 1991, carried out by Professor Geoffrey Shannon, the Special Rapporteur on Child Protection. The section 12 power is the principal means by which the Gardaí intervene to remove a child from the care of their family where there is an immediate and serious risk to their health or welfare. This is the widest child protection audit of a police service ever undertaken. An Garda Síochána commissioned this audit following a recommendation made by the Special Inquiry carried out by Emily Logan, then Ombudsman for Children in 2014, after Gardaí removed two children from Roma families in Dublin and Athlone. The report provides a much-needed spotlight on the child protection role that Gardaí are often forced to carry out in difficult circumstances. “The audit reviewed thousands of incidents where the Gardaí have intervened to protect children. Substance abuse and intoxication of parents is a common thread in the report. In one incident, a child was slapped and thrown into the air in a fast food restaurant, and when Gardaí intervened the child was found to be partially clothed, malnourished and saturated with urine. In another incident a one-year old child was discovered wandering unaccompanied in a housing estate because the mother was intoxicated. Overall Professor Shannon finds that the Gardaí do exercise their powers proportionately and provide a vital safety net for children when all else fails. This is a very important finding. At the same time, he found no strategic approach to child protection and individual Gardaí are not trained in child protection. Shannon also found that the recording of incidents on PULSE (Garda intelligence system) is inadequate because of major discrepancies in recording of information. And while he could find no evidence of racial profiling, he noted that the PULSE system doesn’t record information on the ethnicity of persons. “The Garda Audit also points to failings in communication between the Gardaí and Tusla, the Child and Family Agency. A critical theme in the report is that notification is not communication. Tusla's new protocol in this area is a welcome development. 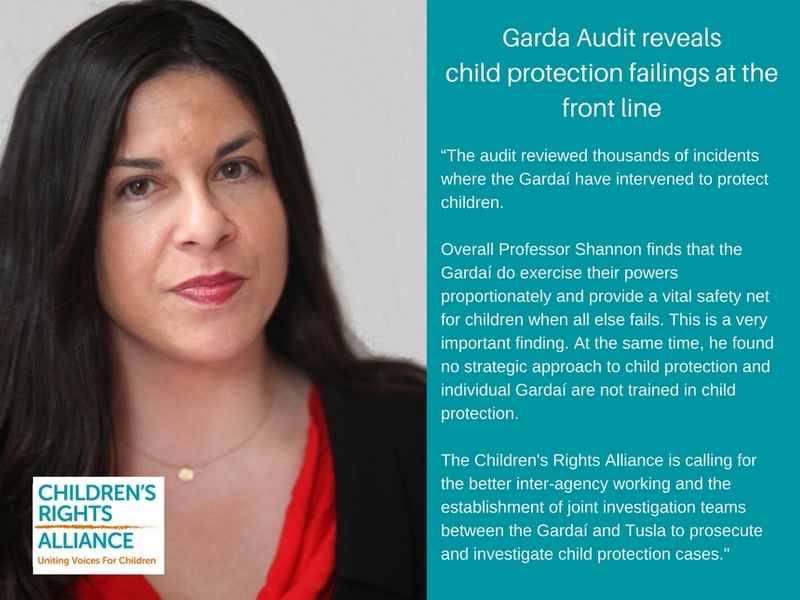 The Children's Rights Alliance is calling for the better inter-agency working and the establishment of joint investigation teams between the Gardaí and Tusla to prosecute and investigate child protection cases. The overriding recommendation from this report is that a properly resourced out-of-hours social work service is needed. Specialist child protection training must also be introduced and the Garda PULSE system reformed. The Children’s Rights Alliance is calling for an Oireachtas debate on this report and for urgent action by Government and its agencies."